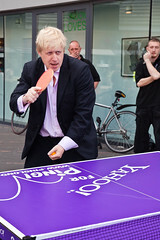 Across London, ping pong tables have sprouted up to encourage Londoners to have a go at ping pong/whiff whaff. All nicely decorated with the various sponsors’ logos, including Yahoo! Note that of those four websites, only one belongs to Yahoo – one of the main sponsors. Surely a major dotcom company, upon committing some sponsorship money to a project, would want their websites or services to be promoted – perhaps Buzz or Pulse – alongside the rest of the web offerings? As of this moment, Project WeaponX (ask HyperHam, she decided on the name!) is due for delivery 15 January, 2011. Mother is doing as well as can be expected – but tips for combatting morning sickness would be *highly* appreciated! Friends and family – thank you for coming to our wedding! Thank you all so much for coming, sharing our happy day, your good wishes and making it the best day of our lives! Formal thank you cards will be going out in the post soon, I promise! If you’ve taken any photographs or videos, we’d love to see them – please let me know! Photo taken by Kate Henderson – thank you! Video by Geoff Marshall – thank you! How difficult can it be to hire a suit? So, the time has come to try and hire a posh suit. I can’t be the only male who has to hire a posh suit and yet hates the entire experience of shopping for clothes – so you’d have thought the male tailors would have tried to make it as easy as possible. But oh no. Thus to Suits You Westfield. Which is a total nightmare of a shop. The first time I popped in, the sales guy kept trying to get me to hire a package for the exorbitant cost of £100. And then when I refused to do so, he put the order on hold so that I could “think about it and come back tomorrow”. He said he wouldn’t be there but he assured me that someone else would be. I popped in the next day. A very disgruntled and pissed-off salesperson eventually deigned to try and recreate my order, but gave up with their insanely slow systems after 20 minutes, and asked me to “come back tomorrow”. Thus, I went into another department store – and they had the opposite problem in being understaffed – thus, every time I try to pop in, the staff are rushed off their feet dealing with other customers. I’ve tried to pop in at three lunchtimes and not had much success – the one time I actually did manage to get measured, I had to wear something that was 4 sizes too small – just to see how it would look – and then realised they didn’t have the lilac waistcoat I wanted. Online was no help – despite the smartgrooms.co.uk website claiming they could supply a suit by the desired date, when I called them it turned out they couldn’t. And I’m still waiting to hear from another website. That’s not even getting into the outrageous cost of hiring a suit – and everyone seems to charge the same prices. If that isn’t something that deserves a complaint to the Monopoly Commission, I don’t know what does. I am using an ancient tiny Celeron laptop to try and surf the modern Internet, with all its social media widgets and Flash files. Hyperham is using a modern fast Intel dual-core laptop to play Dungeon Keeper 2, a classic game from 1998..
Having had a somewhat hectic long weekend around Paris, what should I blog about next? One rule for the BBC, another for commercial broadcasters? Except OFCOM, the commerical broadcast regulator, has reprimanded GMTV for essentially linking to another website from its’ main website. During a broadcast, viewers were invited to apply for free gym passes via GMTV’s website. Once they got there, they were told to click through to moneysavingexpert.com to pick up the gym passes. Ofcom said this is effectively promoting Lewis’s business and breaches rule 10.3 of the broadcasting code which states products and services must not be promoted in programmes. So finally, at long last, America has joined the rest of the world in offering near-universal healthcare to its’ citizens, instead of relying on a hodgepodge of private health insurance coverage. And about bloody time too, if my brief peek into the world of American healthcare was anything to go by. HyperHam and I were having breakfast with her mother, when she started having a mild cough. By the time we’d left the restaurant, it had become a coughing fit and by the time we were in the car, it had pretty much developed into a full-on coughing attack, and HyperHam starting to panic. So we rushed to the hospital’s “emergency ward”, only to be confronted with a counter that had nurses deep into administrative paperwork, and one elderly volunteer sweetly asking how she could help. So I blurted out “She’s choking!”, only to be told “Oh dear… I’ll see what I can do” before the elderly volunteer shuffled off trying to attract the attention of one of the admin nurses. Somehow, a wheelchair arrived and I vaguely remember being told to go this way please – at which point, I wheeled that wheelchair to wherever the nurse was amiably ambling. (With HyperHam inside – I’m not that stupid). We arrived at some kind of place where there were machines that go ping, where they stuck a probe on her. Frowning at the number, we were then directed to an emergency cubicle where HyperHam was wired up to a bunch of more machines that go ping, and a couple of nurses fussed over her while we all anxiously looked on. At one point there was a bit of an almighty flap when the machines that go ping started to go ping-ping-ping-ping, there was a bit more frenetic activity and HyperHam looked close to panic. Fortunately, the machines managed to settle themselves down – but while we were recovering from all this, the hospital administrator decided to wheel herself (and her laptop trolley) in and ask us a bunch of questions. Not useful stuff like her medical history, but things like her name, and WHO HER INSURANCE COMPANY WAS – ie who was going to pay for all this. I’m surprised she didn’t just point-blankly ask for my credit card. Then we spent the next few hours waiting in A&E while the nurses subjected her to a battery of slightly pointless tests – an X-Ray machine was wheeled in, an oxygen pump was brought in – “just in case”, or more likely as HyperHam remarked later, to bump up the amount they could charge back to the insurance company. While all this was happening, HyperHam’s mother tried to point out how nice American healthcare was, and how most people were covered anyway. Those who weren’t covered, she explained, were mostly illegal immigrants anyway. So that’s alright then. To be fair, it could have been a lot worse – I suppose they could have refused to give us any help if we didn’t look like people who could afford to buy the healthcare or if we didn’t have the right insurance card – but in all the times I’ve spent in British hospitals, I don’t remember being asked to quote my NHS number verbatim, or to have to carry a card with my NHS number around. But it seems you have to do that in America, just in case. The doctors and nurses were very nice, very efficient – as they would be. But to this day, we don’t know what happened or sparked off the attack.